Through five weeks, nobody has performed better at the quarterback position in the NFL than rookie Carson Wentz. 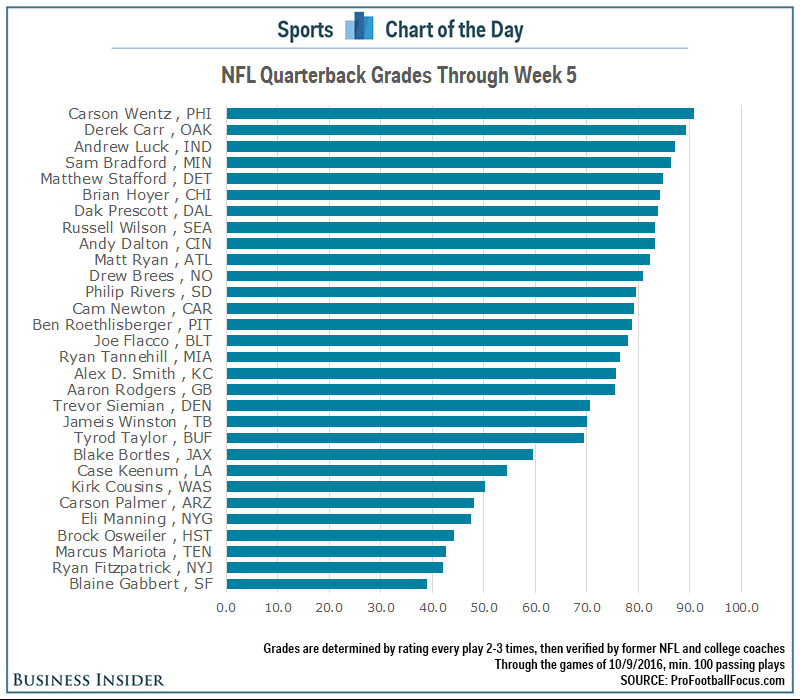 This is according to Pro Football Focus, whose highly respected grading system rates every play for all players and gives them a grade on a scale of 1-100. Through five weeks (not including the Monday night game), Wentz has the highest grade at 90.9 for the 3-1 Philadelphia Eagles. Derek Carr of the Oakland Raiders is second with an 89.2 grade. Meanwhile, several big names rank among the seven worst quarterbacks so far, including Ryan Fitzpatrick (No. 29 out of 30 QBs with at least 100 passing plays), Marcus Mariota (28), Brock Osweiler (27), and Eli Manning (26).